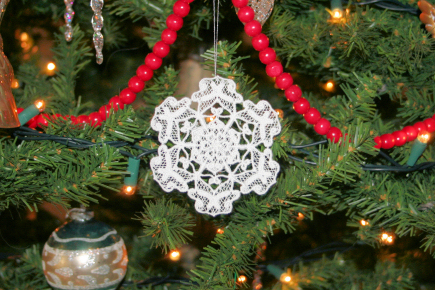 Keeping It Simple - A Beautiful Lace Snowflake and Easy Turtles too. Well, the Christmas music is playing everywhere, most of the shopping is done but the sewing pile still looms, at least at my house. I have at least four more gifts to make before Christmas Day. November and December have been busier than usually with things unplanned but just part of life. So we are doing the best we can and maybe next week will be a little less hectic. Our oldest grandaughter wanted to make snowflakes again this year. "Pretty white ones that look like snow." she requested. "and lots of them." Hmm, I have heard that before and know that after just a few she will be off to something else. Overall she did well though, making amost two dozen freestanding snowflakes. And this week Annthegran has them for 50% off. 1. Made a Christmas Card. 2. 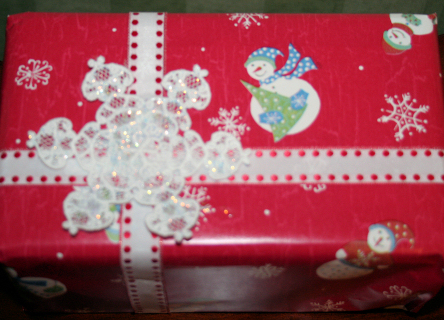 Put glitter on one and used it in place of a bow on a package. 3. 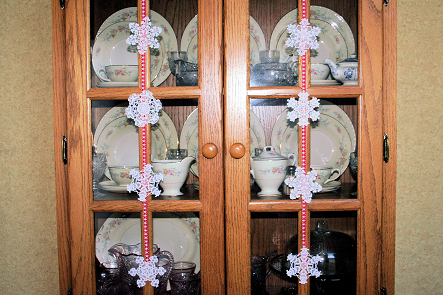 Attached some to ribbons and strung them down the front of the cabinet. 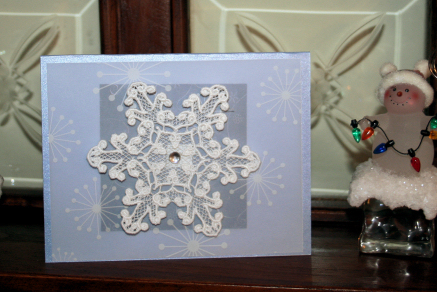 We used the snowflakes from Annthegrans Fancy Snowflake collection. They sewed out beautifully for us and they are half off this week. We sewed them on wash away mesh stabilizer. I would think that Badgemaster would work as well. Then we cut away most of the stabilizer and used a spray bottle of warm water to spray away the edges and holes, leaving much of the stabilizer in to keep the snowflakes stiff. We placed them on a plastic table cloth with old books on top to be sure they dried flat. And we strung popcorn for her tree at home while they were sewing. 6. 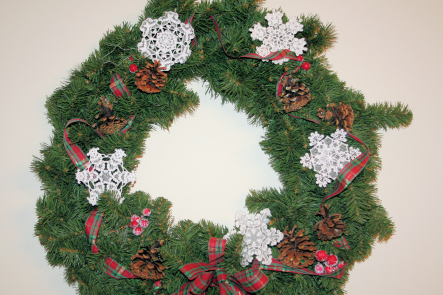 Wrap a ribbon around a clear glass vase and attach the snowflake. 7. Sew the finished snowflakes on a sweatshirt, runner or stocking for a dimensional look. 8. Make garland by stringing them together. 9. Use to embellish a scrapbook page. 10. Hang in the panels of a paned window or door. If you like snowflakes as much as we do here is a blog with a free one in it from last year. P.S. Have you heard how to make easy turtle candy? Top with unwrapped Rolo candies. Put into the oven for no longer than 2 minutes. Remove from oven and firmly press a nut down on each rolo. Let cool completely. Store in airtight container. If you store them in the refridgerator set them out a few minutes before eating. So, easy, and really good. Thank you for the great ideas and I hope you get everything finished and have a lovely day.